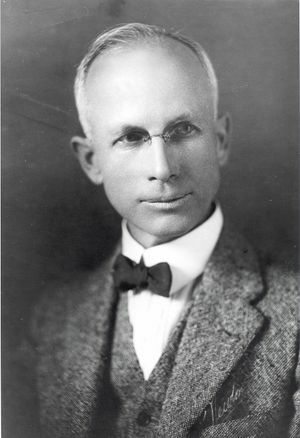 Harris J. Ryan, AIEE President, 1923 - 1924, a university professor at Cornell University and later Stanford University, where he researched high voltage phenomena. Harris J. Ryan was born on 8 January 1866 in Matamoras, Pennsylvania. After attending Baltimore City College and Lebanon Valley College for three years, in 1883 Ryan enrolled in engineering at Cornell University, Ithaca, New York, where he studied under Prof. William A. Anthony. While at Cornell, a field trip to a plant owned by Frank Sprague stimulated Ryan's interest in high voltage transmission. Following his graduation from Cornell in 1887, he worked for the Western Engineering Company in Nebraska for a year before returning to Cornell to teach. Ryan introduced the cathode ray tube as a research instrument in the United States. He acquired his first cathode ray tubes from Germany where they had been developed by Ferdinand Braun, and they were known for some time as Braun-Ryan tubes in the United States. Ryan published an AIEE paper in 1903 on the use of the cathode ray tube as an alternating current wave indicator and received a U.S. patent for an "electric wave form tracer" in 1906. He used the instrument to collect data for a formula expressing the relationship between corona discharge and the size and separation of conductors in a transmission line. The formula was included in an AIEE paper published in the 1905 Transactions. Ryan left Cornell in 1905 to accept a teaching position at Stanford University where he continued his research on high voltage phenomena. Among his numerous publications was a 1915 Proceedings of the Institute of Radio Engineers paper on radio frequency high voltage discharges. To facilitate his research on high voltage insulators, he developed an improved "megger" instrument which extended the range of resistance by a factor of about 160 compared with available commercial instruments at the time. His megger utilized a kenotron (vacuum tube rectifier) to furnish up to 25 kV direct current for measuring leakage current in insulators. Ryan persuaded a number of power companies to sponsor the comprehensive tests of porcelain insulators at Stanford which he and two colleagues discussed in three AIEE papers presented in November 1916. In his paper, Ryan discussed the electrical, mechanical, durability, and cost requirements for successful high voltage insulators. Among his conclusions were that porcelain with appreciable porosity should never be used for suspension insulators and that "defective materials in otherwise well designed and manufactured insulators have been responsible for most of their service failures." He also mentioned that clear fused quartz seemed an attractive substitute for porcelain for high voltage insulators. Ryan was elected to the National Academy of Science in 1920 and served as president of the AIEE during 1923-1924. The AIEE awarded him its Edison Medal in 1925 as recognition for his contributions to the art and science of high voltage power transmission. A high-voltage laboratory named for him was dedicated at Stanford in 1926. In his later years, Ryan worked on the development of electric hearing aids for hearing-impaired individuals like himself. He retired from Stanford in 1931 and died on 3 July 1934 at age 68. This page was last edited on 27 January 2016, at 17:36.